Today, July 19th, as of 10:00 am Central Time, Powder Valley has one-pound containers of Hodgdon Varget powder in stock. Price is $23.75 per pound (not including haz-mat fees or shipping). Given the high demand for the most popular Hodgdon Extreme powders, Powder Valley’s inventory of Varget could sell out. If you are in dire need of this powder, act quickly. 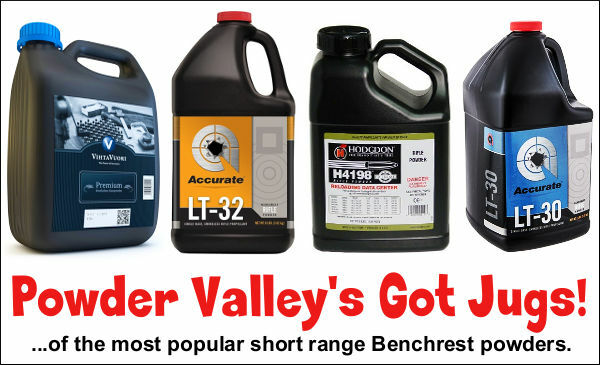 Share the post "Powder Valley Has Varget One-Pounders in Stock"
Is that target good enough? Yes that’s really five (5) shots. This amazing group was shot, in competition, with 6 PPC cartridges loaded with Accurate LT-32 powder. 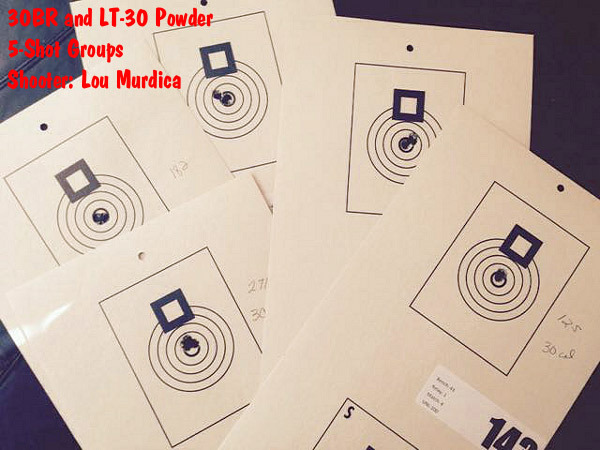 If you’d like to try out this powder in your rifle, Western Powders has released loading data for the LT series of powders. LT-32 is a good choice if you’re currently using propellants with burn rates similar to Vihtavuori N133 or Hodgdon Benchmark powders. (Caution: NEVER simply substitute loads powder for powder. Always start low and work up when trying a new powder). 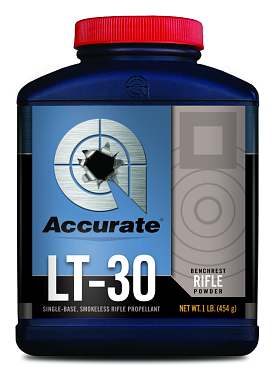 The other powder in Accurate’s LT series, LT-30, has a burn rate similar to Hodgdon H4198. LT-30 is a superb performer in the 30 BR cartridge. LT-30 also is a good choice for small varmint cartridges such as the 17 Rem Fireball. 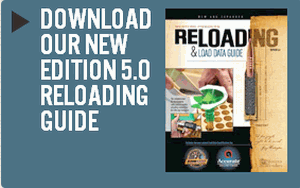 You can also download the complete Western Powders Reloading Guide in PDF format. This covers Accurate and Ramshot propellants. 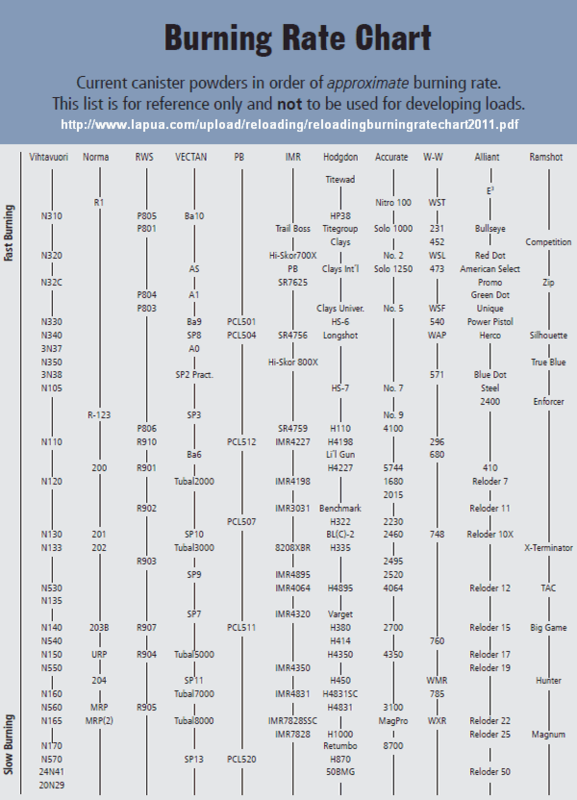 Share the post "Load Data for Accurate LT-30 and LT-32 Powders"
Western Powders has not yet announced an “arrival date” for LT-30, so we can’t tell you when you will see LT-30 at retail powder vendors. It appears this new propellant will go into production in the near future, though LT-30 is not yet listed on the Accurate Powders website. LT-32 is a fine-grained extruded powder that was developed for 6mm PPC benchrest competitors. Already a proven match winner, LT-32′s excellent shot-to-shot consistency and low standard deviation (SD) make this a very good choice for competitive benchrest shooting. Due to its small grain size, LT-32 flows like a spherical powder and allows for very precise hand-loading. It also offers impressive accuracy in varmint and tactical cartridges, including the .223 Rem, and 20 Tactical. If you haven’t tried LT-32 in your PPC or varmint cartridges yet, you should give it a try. 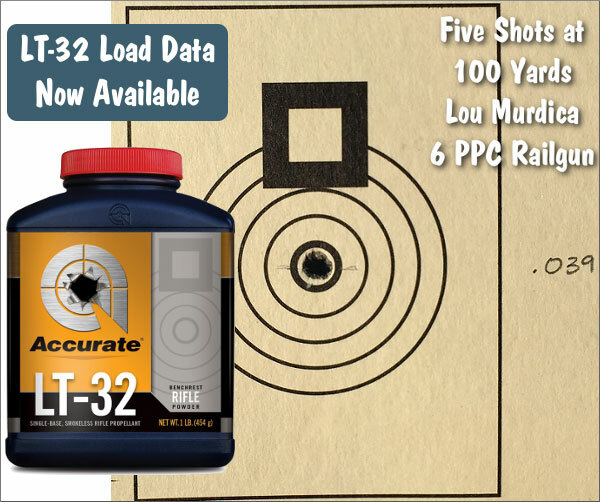 LT-32 is one of the most accurate powders on the market, when used with appropriate bullet/cartridge combos. 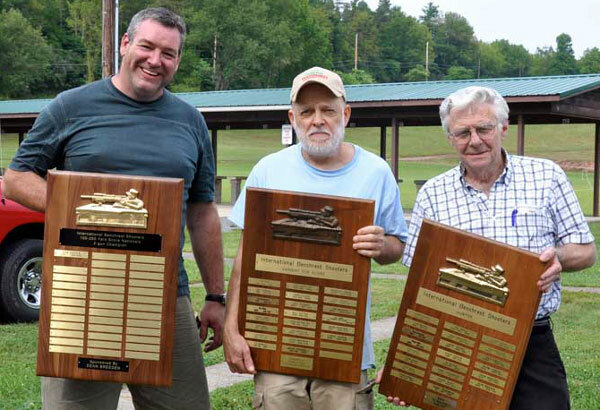 Share the post "New LT-30 Powder — Accuracy Rivals H4198, with More Speed"
Over Labor Day weekend the Union County Sportsmans Club (Weikert, PA) hosted the 43rd annual IBS 100/200 Score Nationals. This club has a reputation for hosting fine events, and this match certainly lived up to that reputation. 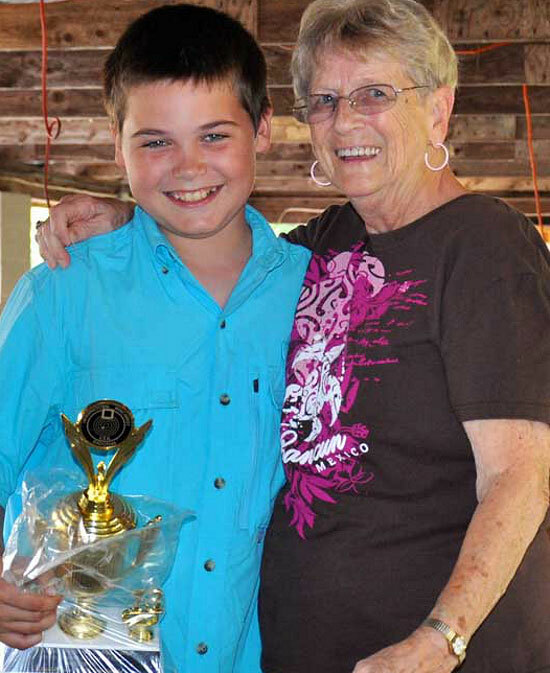 With 63 guns on the line, this year’s Score Nationals was well-attended. All in all this was as good a Score Nationals as I have attended in quite a while. I tip my hat to the Union County crew for running an excellent match. Weather was warm and a little muggy both days. I do not believe we ever had a drop of rain (despite a 30% chance of rain forecast). Mirage was very minimal as it was overcast both days. Winds started out very calm and slowly increased all day long both days. Left to Right: IBS Score 2-Gun Winner Dean Breeden, Varmint For Score Grand Agg Winner Herb Llewellyn, Hunter Class Grand Agg Winner Gary Long. On Saturday, Herb Llewellyn started out on a tear in Varmint For Score (VFS) class and stayed hot, finishing the 100-yard event with a 250-25X score. We witnessed some really fine shooting in less-than-perfect conditions. Junior Shooter Kevin Donalds Jr. (photo below) laid down a fine 250-24X to finish second. Kevin, who turns a ripe old 13 years of age in a few days, shot a remarkable 250-25X Aggregate a few months back. To the best of my memory those are the only two 250-25X scores in IBS this year. A.R. Edwards was third with 23X. In Hunter Class Dean Breeden shot 250-17X beating more than 50% of the VFS shooters, and for those of you who do not fully understand Hunter Class, the big thing to remember is they shoot 6-power scopes. Peter Hills from Maine also shot a 250 in HTR with 9X. Sunday the shooters lined up for the 200-yard event. 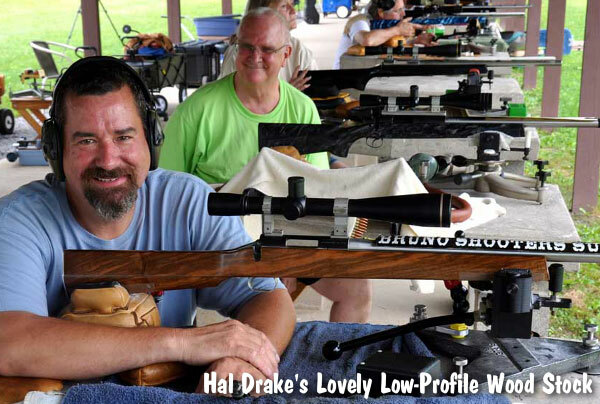 Shooting his 6 PPC, Hal Drake shot a 250-14X, proving that a PPC can still win in a Score match (at least at the longer ranges). Second place (as at 100 yards) went to a Kevin Donalds, but this time it was Kevin Donalds Senior who was the runner-up, posting a 250-13X. Third place honors went to Dean Breeden also with 250-13X. 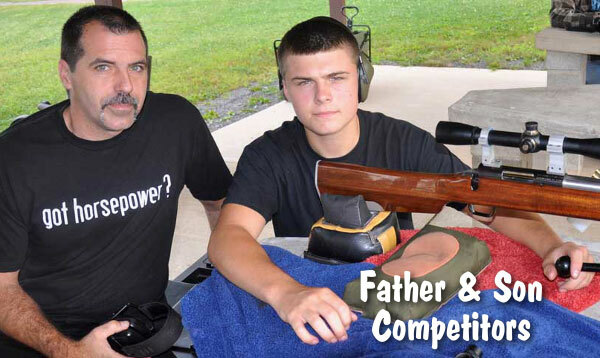 In Hunter Class, veteran shooter Gary Long shot 248-5X to beat K.L. 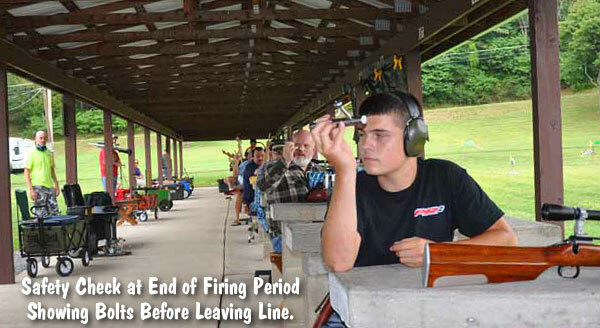 Miller under Creedmoor tie-breaker rules. Dave Thomas was third with 247-7X. You may have noticed that nobody in the top three on Saturday was in the top three on Sunday. This led to some interesting results in the VFS Grand Aggregate. Top Man was Herb Llewellyn, with a 500-36X. Herb’s victory at the Nationals pretty much puts the last nail in the coffin of anybody trying to catch Herb in the Score Shooter Of the Year race. Second in the Grand was Herb’s lovely wife Kim with a 500-34X. Third place went to Randy Jarvais who learned the hard way to not drop the first X! Randy tied with Kim for total score all weekend but Kim shot a 5X on the first target and Randy got a 4X. Fourth in the Grand went to 200-yard winner Hal Drake with 500-33X, and Ricky Read rounded out the Top Five with 500-32X. Gary Long won the Hunter Grand division with 497-22X, Dean Breeden was second with 496-20X, and third was Dave Thomas with 496-14X. It was great to see Dave back shooting again. 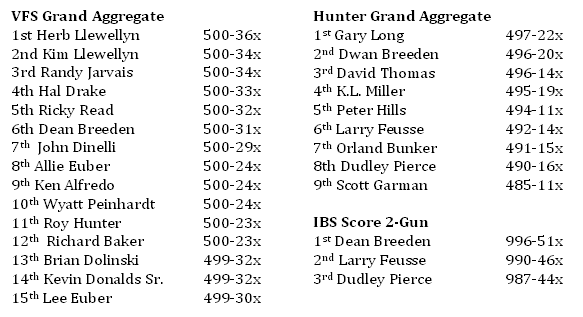 Dean Breeden put in a repeat performance as IBS Score 2-Gun winner with a 996-51X score, Larry Feusse was second with 990-46X and Dudley Pierce was third with 987-44X. I cannot say enough good things about the target crew and range officer Mark Trutt. They ran a very efficient match. I do not recall a single delay all weekend from loose- or erroneously-hung targets. We started promptly at 9:00 am and finished around 2:00 pm both days. Range officer Mark Trutt did an outstanding job when confronted with a tricky situation regarding IBS Score 2-Gun shooters. The range has 40 benches and we had a very nice turnout of 63 guns on the line but it simply was not justified to run a third relay so Mark judiciously added around 10 minutes between each relay to allow 2-gun shooters some time to reload. I don’t think the time would even have been noticed but the target crew was speedy and efficient, so we ended up with a little extra time on the line. I personally felt it made for a very nice, laid-back pace for competitors shooting only one gun. Scoring was fast and efficient for the most part. 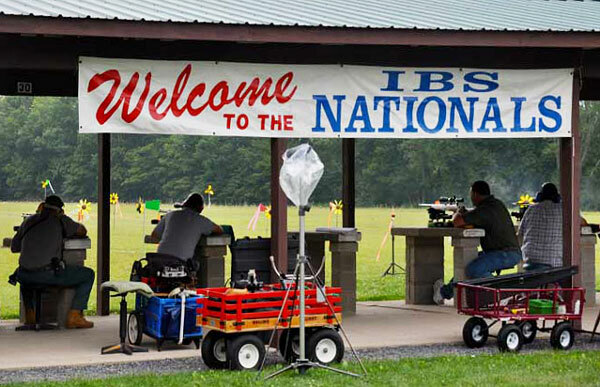 Share the post "IBS Match Report: 2013 Score Nationals at Weikert, PA"
Stan Ware of SGR Custom Rifles, is one of the finest gunsmiths with whom we’ve worked. He’s also a talented shooter and an innovative wildcatter who’s not afraid to think “outside the box”. 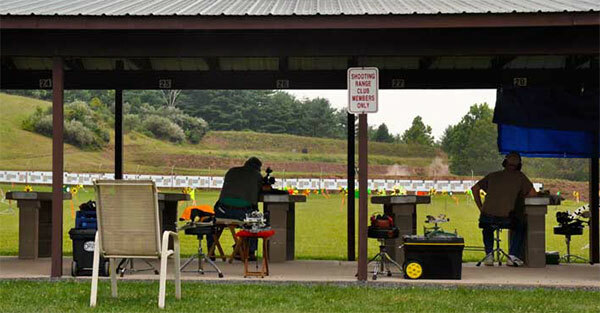 Stan competes in both Hunter Benchrest (HBR) and Varmint for Score (VFS) disciplines. In his quest to build the ultimate Hunter Benchrest cartridge, Stan created the radical “Wolfpup” wildcat, based on a 6mmBR parent case. Noting the dominance of 30 BRs in VFS matches, Stan wondered if a stretched 30 BR could work in HBR competition. The challenge was case capacity. Under HBR rules the cartridge must hold at least 45.0 grains of water, equal to the capacity of the classic 30/30 case. To get the requisite HBR case capacity, Stan figured he needed to boost the volume of a 30 BR case significantly, so he would have to move the shoulder forward — a lot. He did this by running a 30 BR reamer deeper and deeper, test-firing brass along the way. After three reamer passes, he ended up with the capacity he needed (the Wolfpup holds 45.3 grains of water). But then he looked at the finished product — a case with almost no neck, and he wondered “how could this possibly work?”. Ware’s prototype Wolfpup ended up so short-necked, so unlike any “normal” cartridge, that Stan figured it was “dead on arrival”. Stan told us: “I said ‘this ain’t going to work’ and I threw the brass in the trash can. Honest. But later I thought I better shoot it and see what it does.” There was one problem — Stan didn’t have a seating die. He noticed the short neck provided a bit of tension after fire-forming, so he literally seated some bullets, BIB 118s and 125s, with his fingers. 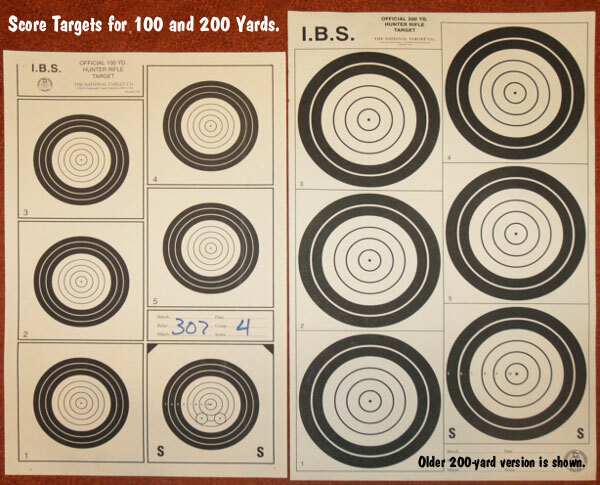 For powder he used H4198 and started with 35 grains, one grain more than a 30 BR load. 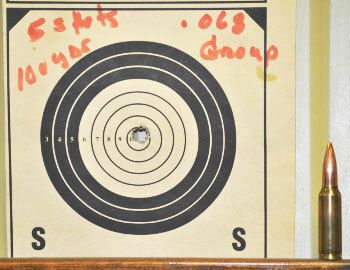 Stan then did a pressure work-up: “I actually went up to 41.0 grains and didn’t have a sticky bolt. I ended up at 37.9 grains of Hodgdon 4198 — that gave 3150 fps, where the sweet spot is.” (Later testing revealed a second accuracy node at about 3020 fps, using 36.4 grains of H4198). Stan’s radical short-necked Wolfpup shot great from the get-go. Once he found the right velocity node, the gun shot in the ones and zeros with both 7-ogive and 10-ogive bullets, both 118s and 125s. The Wolfpup proved easy to tune — it’s not finicky at all. And it’s a winner. Stan began shooting the Wolfpup in 2006 in both VFS and HBR matches and the ‘Pup’ started winning matches right away. 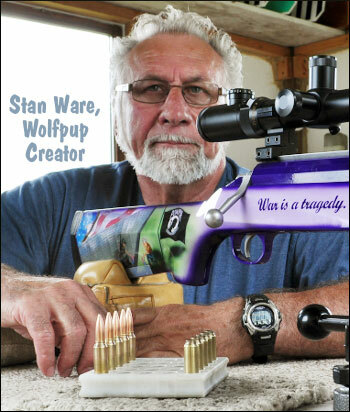 In 2007, Stan won the Wisconsin State VFS Championship shooting the Wolfpup. Most recently, in June 2010 at a Webster City, Iowa VFS match, Stan won the Grand Agg and posted high X-Count for the match, while placing first at 100 yards and second at 200 yards. How’s that for a cartridge that almost ended up in the trash bin? Currently there are no production sizing dies for the Wolfpup. Stan uses two dies to size his fired brass: “I use a 30 BR bushing full-length die after each firing, but that doesn’t size the bottom half of the case. 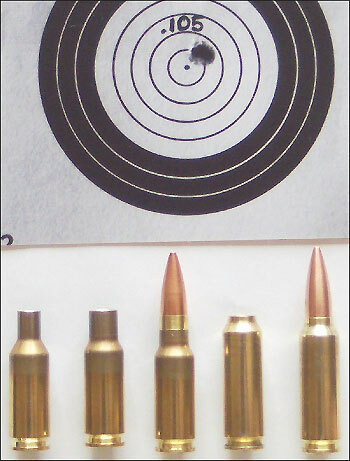 But I can shoot the brass four or five times with no problems.” After four to five firings Stan hits the bottom of the brass with a modified 6mmBR body die. Stan hogged out the top half of the body die so it doesn’t contact the top of the brass. For bullet seating, Stan uses a Wilson 30 BR seater die into which he ran the chamber reamer. This gives perfect case fit during seating operations. Stan has received a number of requests to chamber Wolfpups for Hunter Benchrest shooters, and he will be building some for next season. Stan charges $300.00 for chambering, crowning, and headspacing a barrel. He also sells Wilson micrometer-top seater dies, customized for the Wolfpup, for about $110.00. If there is sufficient demand, he may start producing “one-pass” full-length sizing dies for the cartridge. 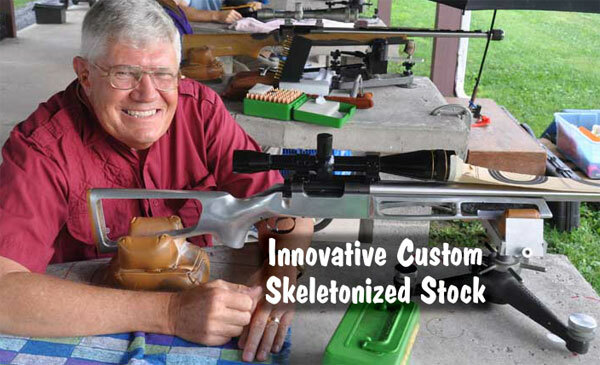 Stan can also build complete benchrest, hunting, and long-range rifles in your choice of calibers. 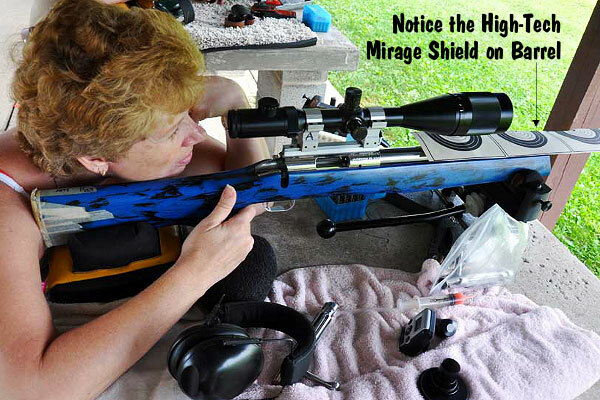 Visit SGRCustomRifles.com, or call (507) 274-5649. You’ll notice Stan’s stock contains scenes from Vietnam and a quotation. Here’s the story. A Vietnam combat veteran, Stan served “in-country” with the Army’s 509th Non-Divisional Combat Unit (out of Fort Riley) from 1965-1966. Shortly before he left Vietnam, Stan went to a shop to have a souvenir lighter engraved. He asked the vendor for an appropriate inscription. The shop’s metal-worker engraved: “War is a tragedy. It takes mans’ best to do mans’ worst.” That message, along with the combat scenes, were hand-painted on Stan’s rifle by his wife Susan, a talented artist. 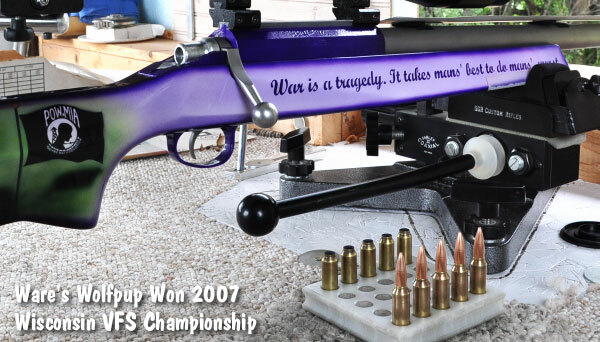 She spent more than 20 hours painting the rifle stock. 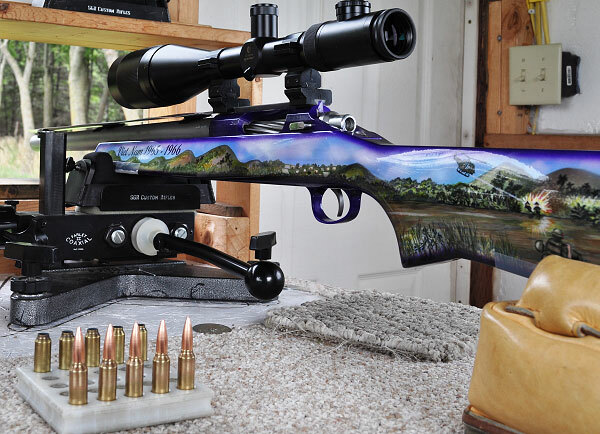 Photos courtesy Ryan Ware and Stan Ware, SGR Custom Rifles. 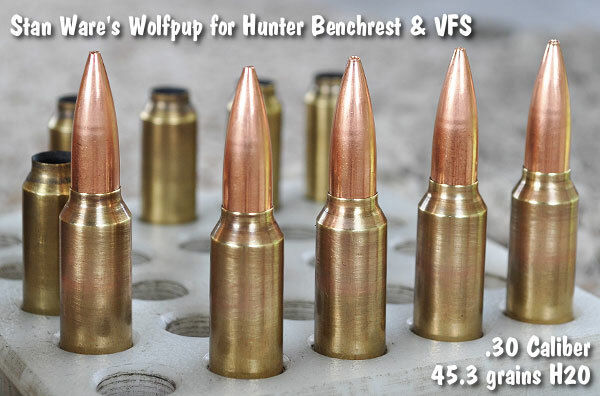 Share the post "Stan Ware’s Radical Short-Necked Wolfpup for Hunter Benchrest"